The olive is a dynamic and unique residential development that unfolds behind the leafy rise of Goodwood Hill along the tree lined Balmoral Road. The site is constrained and flat in aspect. The challenge for landscape was how to make best use of the limited space in order to create useable external areas, maximise views, amenities and planting to enhance the development’s residential offer, and provide an environmental enhancement appropriate for the surroundings and district context. Landscape folded like origami threads throughout the 12 storey development and provides garden amenities for the twenty three exclusive private apartments. This residence is not surrounded by greenery, but architecture which appears folded and formed by the landscape. The language of the sloping planter beds and folded hedges is the key element to the facades, they are a distinctive visual feature for the whole development. Drawing from the beauty of the established forest vegetation of the Balmoral area, the planting scheme incorporates the rich green hues of species native to Singapore and the Malay Peninsula. The extensive use of sky rise greenery at The Oliv gives the impression that each of the apartments are a landed property. The rooms extend and interweave into the garden and the edge of the apartment becomes a terrace that can be inhabited by the residents, where they can enjoy natural green textures and fragrances. 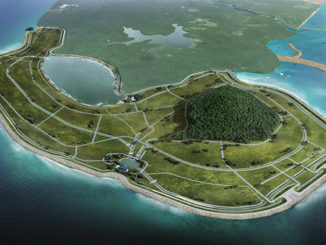 The project develops Singapore’s ‘City in a Garden’ aspiration by making landscape and greenery crucial to the project. The design approach encompasses the horizontal ground planes which extend all the way up to the vertical faces of the building facades. This greenery is experienced on many levels, it enriches street views, is experienced at close range by the residents but also importantly is enjoyed by the neighbours who share the benefits of the verdant vegetation. 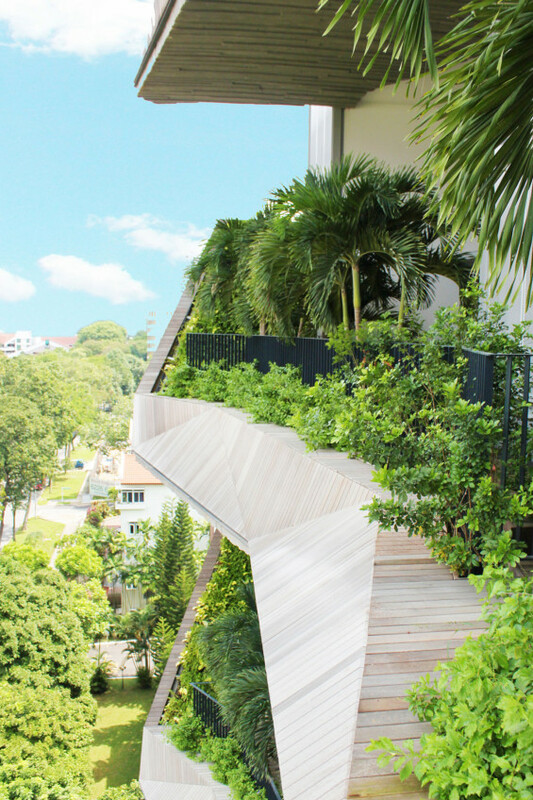 The sky terrace planting has been carefully selected and is appropriate in height and form, vegetation sits comfortably under the overhanging sky terraces above. The deeply cantilevered sky terraces act as horizontal sunshades to the South East and North West facing facades. Planting envelopes all surfaces of this development including the ground, walls, internal courts, roof and terraces. 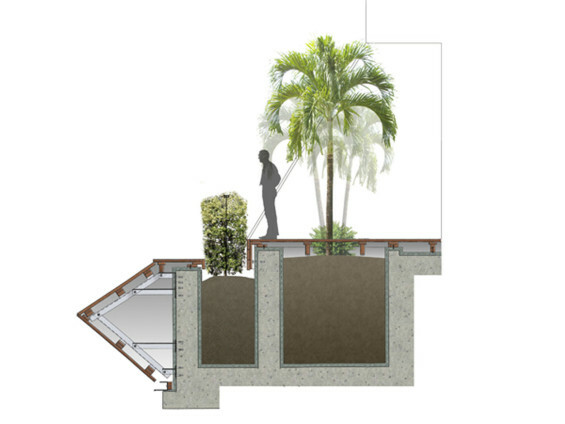 Landscape and garden spaces are used as a connecting element for all communal spaces within the development. 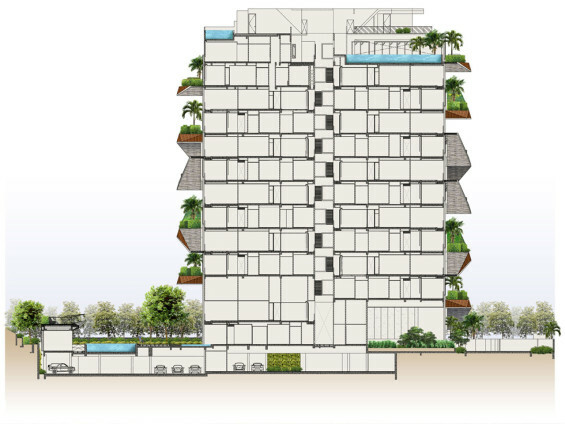 Rather than making a single sky terrace on only one level of the building the sky terraces are divided so that almost every level of the building has a lush green communal garden space with water features. 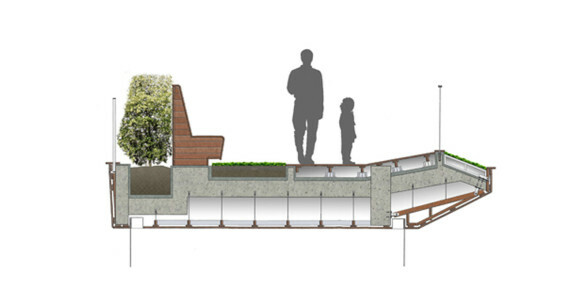 The communal sky terrace gardens are used as social gathering spaces or for quiet contemplation in a garden setting. Folded greenery continues at the ground level and connects the communal recreation facilities, where shared cooking areas, gym, clubhouse and swimming pool are all enveloped by lush greenery. Further communal green spaces are created on top of the clubhouse creating a social gathering space and a children’s playground including a roof terrace flanked with fragrant native planting. 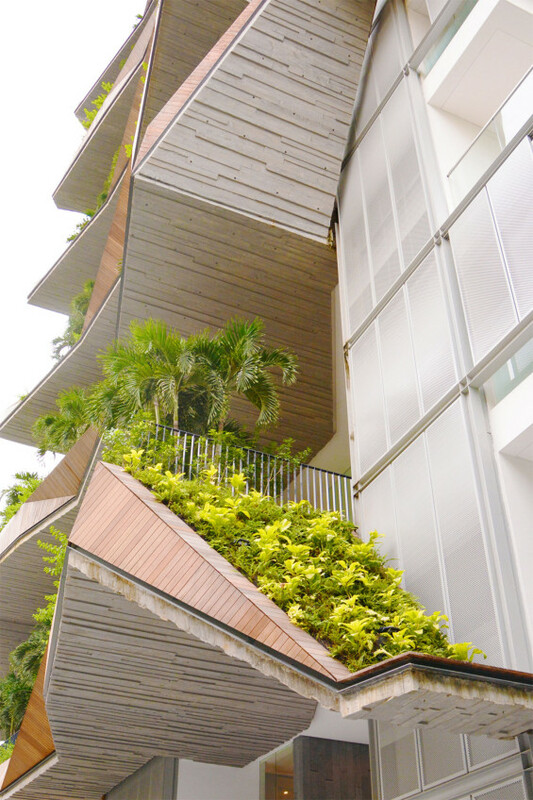 The extensive landscape at all levels of the building not only provides a verdant amenity for the residents but also creates an extended habitat, refuge and food source for the insects and birds. The development has become a habitat for the Black-naped Oriole and the Olive-backed Sunbird which are regularly spotted enjoying the newly established gardens. 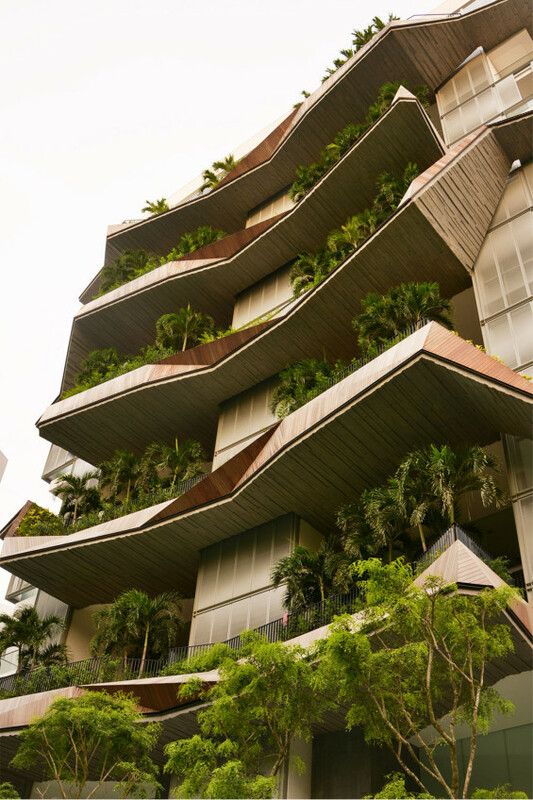 In order to provide the extensive greenery to the whole building careful consideration has been taken to provide a sustainable, safe and robust landscape solution. The depth required for planting on the Sky Terraces is cleverly concealed and made into a feature in the form of a beautifully folded timber edge to the Sky Terraces. The planters cover a large area to allow for very good long term root growth. The soil bodies are covered with timber decking that has been spaced to allow for air flow and rain to pass through. A fully automated irrigation system has been installed and allows for scheduled programing, the system uses pressure compensated drip emitters as a water saving device. Rain sensors monitor the amount of rainfall and shut the system off to prevent unnecessary watering. The sloped green wall panels are 80mm thick and are made up of a cushion that is filled with a specially formulated mix of coconut fibres and peat moss. For the maintenance of the sloped Green Walls, a system of carefully spaced stepped platforms and a safety clip in framework has been installed so that maintenance personnel can safely perform maintenance operations. 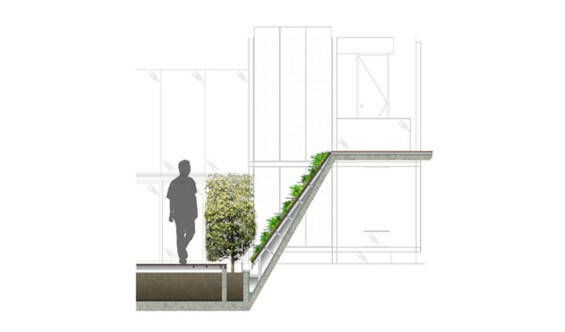 The stepped platforms are designed primarily for worker safety, and carefully concealed amongst the planting so they are not seen on the façade. As the sloped green wall panels are subject to different light level conditions dependant on the orientation, the plants have been selected accordingly.